Last week I felt the sudden pang of an emotion that I haven’t experienced in a very long time: excitement. It took me entirely by surprise not least because it arose from such a painful place. During the twelve months since I launched this blog I have also been writing a book. While my blog posts tend to capture momentary or episodic observations about grief – and serve as extracts from a rather public diary – my book captures an entire year of live grief, documented as it happened, and set against a backdrop of the happy, fun and loving life that my little family enjoyed before its very linchpin was killed. In some ways getting our story down on paper is the most emotionally challenging thing I’ve ever done; in others the most emotionally rewarding. Nothing else I could have done in response to my wife’s death would have forced me to chronicle the incredible pain of losing her the way that writing the book has. And yet, equally, nothing else would have enabled me to so enthusiastically detail the wonderful, joyful and often hilarious times we spent together over the course of the eight years since we first met. In recording our lives, which I’ve done much for the future benefit of my son, I’ve cried many tears of both hurt and happiness. I was living through the hurt as I wrote, but I was also able to return to my old, happy life in the only way I now can – by recalling and capturing memories through words. And I would lose myself in these words, spendings days with my wife’s character – something that could never fail to put a smile on my face even through the often overwhelming grief. As the book’s narrative focuses on the first year since losing Desreen, I finished writing it in November. I’ve since felt myself come crashing down to earth emotionally as my subconscious mind adapts to the fact that she really is gone; that for the past year her presence has been entirely mental rather than physical. Saying that I’ve been down since completing the book would be a huge understatement, so to feel this sudden emotional pull of excitement last week really shocked me. ‘Would you like to reveal the cover next week?’ my publisher asked. For the first time since embarking on this project it actually felt like I’d written a book. And while I had no ambitions to do so before tragedy struck my family, the personal nature of it all couldn’t fail to move me. When I look back at this book in future I don’t think that I will see it as something that I achieved, but rather something that my wife and child made happen. That, I believe, is why I felt such a strong physical response last week. I knew that it meant I could finally share something that I’ve lived with for over a year, which has touched me so deeply. Ours is the story of a man and child who lost the woman we love and what happened in the year that followed. In it I describe the often conflicting emotions that come from facing grief head on and show the strange, surprising and cruel ways in which it can take hold. I express what it means to become the sole parent to a child who has lost his mother but cannot yet understand the meaning of death. 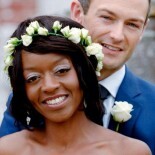 But through the shock and sadness of our lives after the Desreen’s death shine moments of hope and, I’m told, humour. So much of what I’ve learned comes from watching our son, Jackson, struggle, survive and live – as children do – from moment to moment, where hurt can turn to happiness and anger can turn to joy. The book’s title itself is a direct quote from Jackson; a moment of sheer pleasure, which suddenly broke my once seemingly unmovable grief. The story behind the book’s cover is much the same. Taken on my iPhone just days before his christening (ten months after Desreen died), I captured a stunning moment with Jackson in his maternal grandparents’ back garden where Desreen played as a child. My mood was heavy that week not least because my wife’s absence in her own family home felt so acute. My father-in-law took charge of Jackson for a little while and introduced him to the concept of gardening. No sooner did my son have a hose pipe in his hand than I was soaked. I hadn’t seen him have so much fun in ages and it was in that moment that I realised that it is possible to be happy and heartbroken at the same time; that grief is nothing if not conflicted. When I look at this picture I smile at the unadulterated joy on my son’s face. I feel a sense of Desreen’s own childhood touching our little boy’s. I imagine her spiritual presence in the sunshine that beams down upon him as he plays. I actually see her physical presence in his appearance; Jackson looks so much like his mummy. The image also helps me, once again, to understand how children can lighten the heaviness of the adult world by sharing the happiness of theirs. And that’s something that my son has done for me every single day since my wife died. It’s Not Raining, Daddy, It’s Happy is available to pre-order in hardback and ebook from today (see also www.amazon.co.uk/dp/1444754777). It’s a beautiful photo. Good luck with the book. I really would like to read this book, the cover is perfect. I have a feeling your book will do well. What a powerful moment and a fabulous picture and title, good luck with the book, I know it will touch many who are grieving. It really is a beautiful photo, he is obviously having a ball, splashing and spraying with the hose. I am in a grief stricken state at the moment due to the sudden death of my dad. Your book has helped me realise that I am normal and not going nuts. You are right everyone is different and trite comments were difficult to take. Your very honest account has really helped thank you. 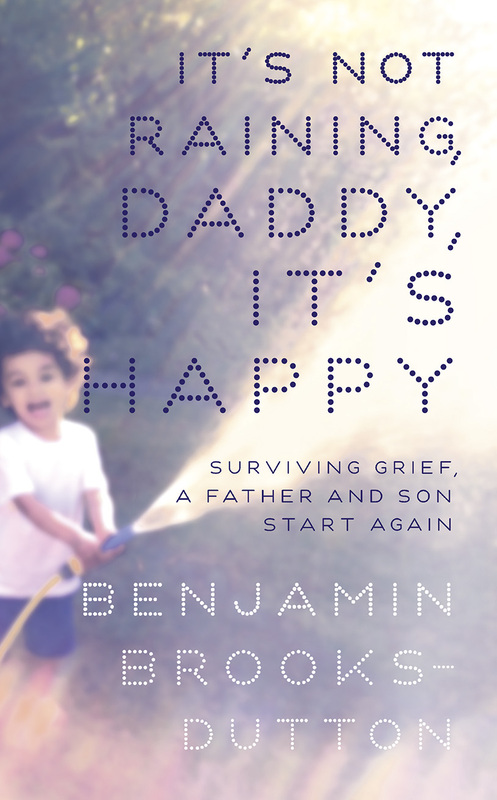 This entry was posted on January 15, 2014 by Ben Brooks-Dutton and tagged Amazon, bereavement, book, book cover, children, conflict, Desreen Brooks, grief, It’s Not Raining Daddy It’s Happy, life as a widower, lifeasawidower, loss, love, male grief, mummy, toddler grief, toddlers, widow, widower.